American. Craft. NYC. What a day!! 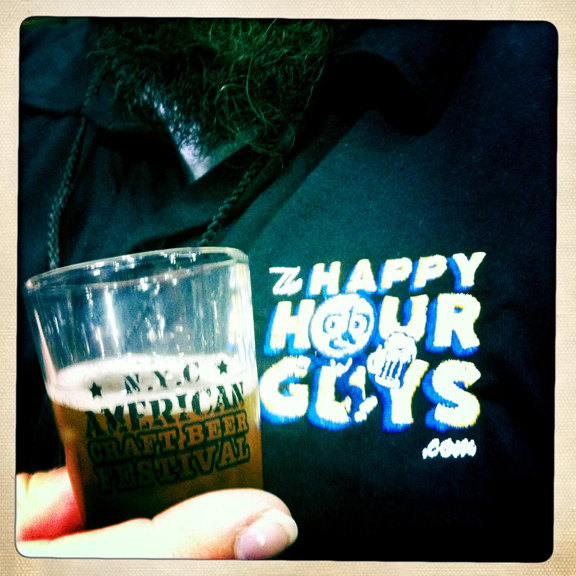 The inaugural NYC American Craft Beer Festival hit the Lexington Armory today with a sound wallop. The Guys at the Fest. You can tell it's Squigs by the scraggly goatee.Squigs (Artsy Guy) here. Where to start? There were craft brews from all over this great nation of ours: Kelso, Stone, Weyerbacher, Great Divide, Rogue, Victory, Cigar City, Clown Shoes, Wandering Star, Brooklyn, Green Flash, Long Ireland, Empire, and on and on and on. And everyone brought some A game. This hop head was particularly jazzed with a lot of IPAs, double IPAs, and black IPAs on the docket. But there was so much more, and we happily took the tour in two ounce servings. In addition to the suds, there was food to be had. I particularly enjoyed the pulled pork sandwich with twice-baked potato salad on top. Jimmy devoured a Frito pie. And there were tables offering ways to connect with fellow beer lovers, books for purchase (our pal Josh Bernstein with his Brewed Awakening), apparel, and more. And a special package deal allowed folks into the connoisseur lounge for an extra fee. We have to say that the perk was well worth it. Pours of special limited and vintage releases from some amazing breweries. Live music. Nosh presented on trays. (I particularly enjoyed the bacon wrapped scallops.) And all of this in a dimly-lit (and muraled) downstairs room in the armory that had a fun speakeasy feel with setees and standing tables. Jimmy and his Frito pie. The Connoisseur Lounge. Happy Guys with big beers. Jimmy! Sean McCain from Victory! Olivia Cerio from Empire! Chris Cuzme from Wandering Star! Amy Litt, social media genius! And Squigs on the Hipstamatic! Community.Mastermind Robert Howell led a team that organized an event that to this Guy seemed to run seamlessly. His background in huge rock events was evident. And the craft beer community was out in force. As The Happy Hour Guys always say, the best thing about events like this and the craft of craft beer is the community it all brings together. 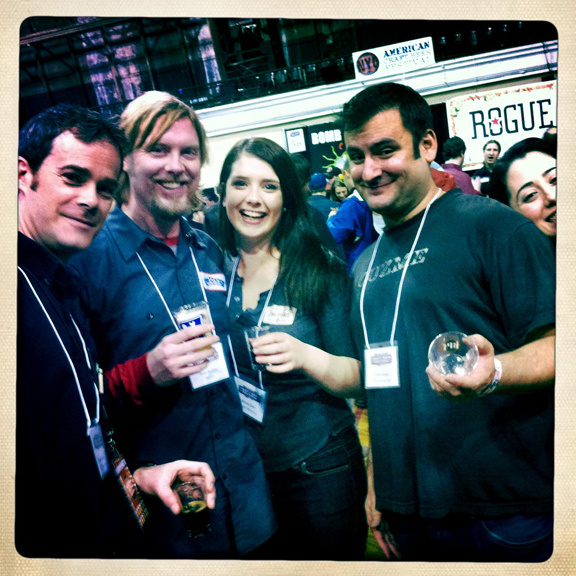 It was great to see old friends and meet new ones, all brought together by the art of beer. Jimmy and I encourage you all to keep an eye on this event which we hope wallops us again in the future. That's what's HOPpenin', y'all! Cheers! 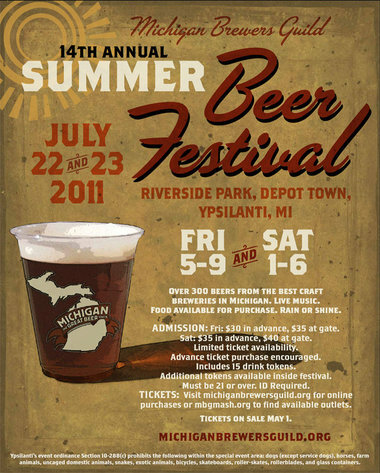 DISCOUNT: $20 off the Get Real Belgian Fest, July 8-9! Hey Happy Hour Nation! 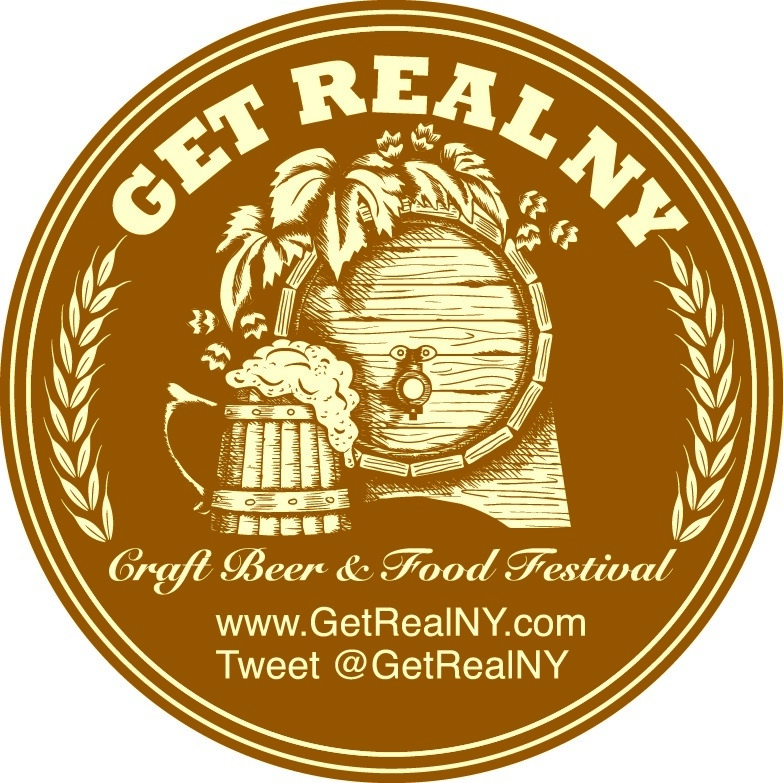 If you're in NYC on July 8-9, (and now you have a GREAT reason to come) we are offering a SPECIAL DEAL to our web fans - the Get Real Belgian Fest in NYC is going to be off the hook, and you can use the discount code "happyhour" at checkout and you'll get $20 off the regular ticket price! Now that's a Happy Hour Deal. Just one more way to thank our fans, which are the greatest in the universe!